When it comes to cleaning our home, one of the biggest obstacles we face is cleaning the stairs. It is hard to manoeuvre a bulky vacuum cleaner on stairs; there simply isn’t enough space to get the job done properly. The best vacuum for stairs is one that is lightweight and flexible. Uprights are still the number one vacuum choice in the UK but when it comes to cleaning stairs, they are not always the best option. Stairs are almost always too narrow to fit the vacuum, and when using the hose the suction is greatly reduced to the point of near useless. Then there is the fact that most vacuums have power cables that can’t reach to the top of the stairs, meaning you have to stop cleaning halfway and plug the vacuum in at the top. This all leads to a lot of frustration and wasted time when cleaning the stairs. If you are one of the many people who avoid hoovering the stairs altogether because of the hassle, then I am here to help. I have spent countless hours researching, scanning customer reviews, and checking manufacturer descriptions of various vacuum cleaners. 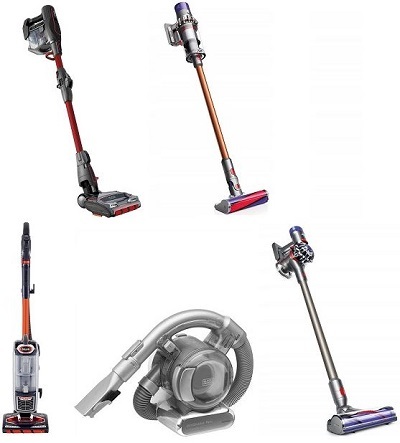 As a result of this research, I have found the top 5 vacuum cleaners for stairs. There is a mixture of cordless sticks, lift-away uprights, and handheld vacuums, that all excel at stair cleaning. The good news is that these vacuums are good for cleaning your whole house, so you won’t need a separate vacuum just for the stairs. The Shark IF260UKTH is the perfect vacuum cleaner for cleaning stairs, and I have awarded it the best overall. It is cordless, lightweight and flexible, and can even convert to a handheld vacuum. It definitely ticks all of the boxes when I hear people describing what their main frustrations are with cleaning stairs. Cordless vacuums have come a long way from the days of only lasting 10 minutes before needing a recharge, but the run time is still the main reason that puts people off buying a cordless model. While the average run time across all cordless vacuums is around the 30-minute mark, The Shark IF260UKTH comes with twin batteries, giving you a total cleaning time of 60 minutes. This is more than enough time to clean your whole house, not just your stairs. Unlike some cordless vacuums, this Shark model doesn’t require the battery to be in the vacuum while it is charging (although this option is available should you require it). This is very handy as it means you can vacuum while the spare battery is charging, and then swap them over when needed. Most modern vacuum cleaners come with a HEPA (High-Efficiency Particulate Air) filter, and this is essential if you are anyone in your home suffers from allergies. However, a HEPA filter alone is not enough to protect you. Many vacuum cleaners have filters that are not completely sealed into the vacuum, meaning allergens can bypass the filter and escape back into the room. This situation can actually increase the number of allergens that are present in the air, aggravating any allergies. The Shark IF260UKTH features an Anti-Allergen Complete Seal system, so the HEPA filter is completely sealed in. This means that every single particle is forced through the filter and cannot escape back into your room. 99.9% of dust and allergens are captured thanks to this system, meaning that the air you breathe will be just as clean as your floors. Included in the IF260UKTH are Shark’s two innovative technologies, Flexology and DuoClean. Flexology is a unique feature to Shark vacuums that allows the vacuum to bend in the middle. This is achieved by a hinge in the middle of the wand and is operated with a simple switch. One flick of the switch and you can easily clean under low furniture such as beds and sofas. This is also incredibly useful when it comes to cleaning stairs. Flexology also means that storage is easier for this vacuum. When you are finished cleaning, you can fold it in half and instantly save space. DuoClean is another of Shark’s unique features, and it is a real wonder why more vacuum manufacturers don’t adopt it. DuoClean is basically two brushes that work together to ensure that every crumb or dust particle is picked up. There is a soft brush that is in place of the front wall of the vacuum head, and this removes the frustration of pushing dirt and debris along the floor as you clean. Instead of pushing, the soft brush actually pulls in the dirt and works very well. The second bristle bush is designed for removing dirt from deep in the carpets, and also works amazingly well at picking up pet hair that is stuck in the fibres. The combination of the two brushes means that there is no need to change heads or flick a switch when moving between surfaces; you can seamlessly glide between carpets and hard floors. 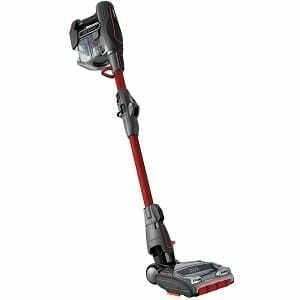 It’s easy to see why the Shark IF260UKTH has been awarded the best overall vacuum for stairs. The ease of use and number of features make this a vacuum that shines in every area of your home, not just your stairs. The Dyson Cyclone V10 Absolute is the fourth generation of Dyson cordless stick vacuums that have revolutionised the way we clean. Starting from the V6 back in 2015, we’ve had the V7, V8, and now the V10. With each new model in the range comes more features, more powerful suction, and better battery life, and the V10 is no different. This is one of the best stair vacuums and missed out on the top spot largely because of the huge price tag. The main reasons why the Cyclone V10 is great at cleaning stairs is because it is lightweight and powerful, but also because of the accessories and tools that come bundled with it. For carpeted stairs, the mini-motorised tool is designed to tackle ground in hair and dirt, and the small size makes it perfect for cleaning the tight spaces on stairs. This tool can also be used on upholstery and is especially useful if you have pets in your home. The crevice tool is even narrower and this makes it ideal for cleaning right into the edges and backs of stairs. The crevice tool works great on carpets and hard floors, depending on which type you have. If your stairs are not carpeted, then the soft dusting brush and the combination tool will work together to leave them clean and shiny. The combination tool can be used on carpets and hard floors, so if you have wooden stairs with a carpet runner you can easily clean both of them with the flick of a switch. Throughout the years, Dyson has made a lot of noise about their cordless vacuums having the most powerful suction. The V10 absolute is no different, with Dyson claiming this machine has the most powerful suction of any other cordless vacuum, and who are we to argue? For starters, the V10 is powered by the Dyson digital motor V10, which has many improvements over the previous V8 motor. Dyson are improving things constantly so I’m sure it won’t be long until we see a V11 or V12 motor. This vacuum also features 14 cyclones, which generate a huge amount of centrifugal force to throw microscopic particles – such as pollen and bacteria – off your carpet and into the dust bin. Another feature that goes towards improving the suction is the design. The V10 Cyclone has been cleverly designed in an in-line configuration, meaning all of the important components are in a straight line which allows air to flow more freely. Dyson claim this design change has resulted in a 20% improvement in suction power. All of these improvements mean that you will be able to remove more dirt from your stairs. 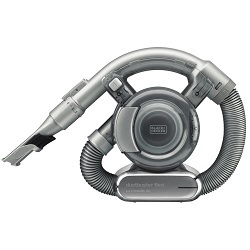 Like the Shark vacuum, the Dyson V10 Cyclone Absolute has whole machine filtration. The sealed system traps 99.9% of all allergens in the vacuum, pushing every particle through the HEPA filter. The HEPA filter in the V10 Absolute has been designed in a way that it lasts the lifetime of the machine, and it is also washable. The Dyson V10 has been certified as asthma and allergy friendly by the Allergy Standards Limited, which is the world’s most recognised asthma and allergy certification. This means that you can be safe in the knowledge that you are cleaning with a vacuum that has been approved by experts. If money is no option, then the Dyson Cyclone V10 Absolute runs the Shark IF260UKTH very close in the battle for the best stair vacuum. It is definitely a hefty price tag, but you should look at it as an investment in your families health, and also how much time and effort it will save you in the long run. I know that I said an upright vacuum is not the best option for cleaning stairs, but the Shark NV801UKT is in a league of its own. Shark has revolutionised the upright vacuum market with its innovative features such as lift-away and DuoClean, and this vacuum is without a doubt the best upright vacuum for stair cleaning. Shark was the very first vacuum manufacturer to release an upright vacuum that had a detachable canister, and this unique design has propelled them to become one of the most popular cleaning brands in the UK. At the click of a button, the whole canister completely detaches from the main vacuum body. This allows you to easily clean hard to reach areas, ceilings, and most importantly it makes vacuuming stairs a breeze. Gone are the days of trying to balance a heavy upright on a narrow stair, the Shark NV801UKT allows you to hold the canister in one hand while you hold the hose in the other. This is not only a safer way to clean, but it also means you can really clean the carpets and get right into the edges. Previous Lift-Away models worked well, but they relied purely on suction when the canister was detached which isn’t as powerful as when using it as an upright. This particular model features a powered lift-away function, which essentially means that it delivers power directly to the brush roll, resulting in a more powerful cleaning operation. Like all recent Shark models, the NV801UKT features Shark’s patented DuoClean technology. There is a soft roller brush in place of the front wall of the vacuum head, combined with a bristle brush in the middle. What this essentially means is that instead of pushing large particles around the floor when you are cleaning, the soft brush actually pulls dirt into the head. The bristle brush is great for getting dirt and hair that is embedded in carpets, which is especially useful on stairs. The DuoClean head is especially useful if you have a mixture of carpets and hard floors, as there is no need to change heads for different surfaces. 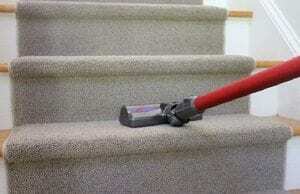 This makes it easy to clean wooden stairs that have a carpet runner. Like the Shark IF260UKTH, this model has an Anti-Allergen Complete Seal system. This captures and traps 99.9% of all allergens inside the machine, and because it is sealed the dust and allergens are not released back into the air you breathe. Combined with the HEPA filter, this creates a vacuum cleaner that is excellent if you or someone in your house suffers from allergies. As well as allergies, the Shark Powered Lift-Away is great at dealing with pet hair. It comes with a specially designed TruePet tool which works deep in the fibres to remove even the most stubborn pet hair. The pet tool can be used on car seats, sofas, carpets, and stairs. 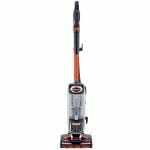 While the first two vacuums on this page are cordless, the Shark NV801UKT upright is a corded model. The benefits of cordless vacuums are still a big talking point, with many people still on either side of the fence. A corded model does mean that you won’t have to deal with flat batteries and charging docks, and they do tend to have better suction. The limiting factor is obviously the power cord, but with a nearly 10-metre reach, this should be more than enough to clean your home without having to change the power socket too many times. If you are still not convinced by the cordless vacuum trend, then the Shark NV801UKT upright vacuum is a solid option and makes cleaning stairs a much more enjoyable task. The Black & Decker PD1820L is a cordless handheld vacuum that is powerful, lightweight, and perfect for cleaning stairs. 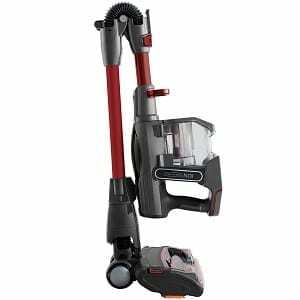 This is a budget vacuum and is much cheaper than the rest of the vacuums on this page, so while you probably wouldn’t use it as your main vacuum it will do the job nicely if you are looking for a dedicated vacuum for your stairs. The first thing that you notice with the PD1820L is the unique design, which is almost snail-like. It features a base where the battery is located and a fully removable translucent dirt bowl. 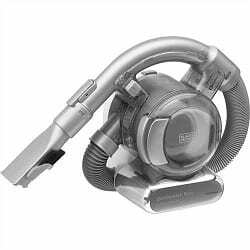 The hose wraps around the body of the vacuum and can easily be detached depending on the area you are cleaning. The 1.5-metre hose is long enough to clean almost any area in your home, and the fact that it is a handheld means that you are not restricted by a power cord. This makes the job of stair cleaning easy and allows you to get right into the edges of each stair. This Black & Decker vacuum weighs less than 1.5kg, so it is very lightweight and ideal for those with mobility or health issues. The weight also makes it easier to clean hard to reach areas, as you can hold the vacuum in one hand while using the hose with your other hand. The 18V Lithium-ion battery does not detach from the vacuum, instead, you place the whole vacuum of the provided charging dock. The charger is an eco-smart charger, and it can fully charge an empty battery in 4 hours. This is a lot quicker than most cordless vacuum batteries and is handy if you forget to charge. The run time on this is only 15 minutes, which is significantly shorter than the leading cordless vacuums. When you consider that the PD1820L is a quarter of the price of some high-end models, this is understandable. 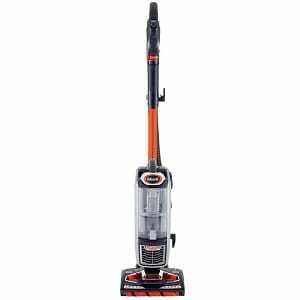 As I mentioned above, you probably don’t want to use this as your main vacuum as it is not as powerful as traditional vacuums and lacks the run time. However, if you use this as a vacuum just for your stairs then 15 minutes will be more than enough time to get the job done. One of the reasons the Black & Decker PD1820L is so good for cleaning stairs is the tools and attachments it comes with. There is both a long and a short crevice tool which are ideal for getting into the edges and right in the backs of stairs. The soft brush attachment is great if your stairs are wooden and if your stairs have a carpet runner then all of the tools can be combined to maximise cleaning efficiency. The tools are stored on the vacuum itself so you always know exactly where they are when you need them. The Black & Decker PD1820L is not going to win any awards when it comes to suction power or battery run time, but if you are looking for a budget-friendly vacuum cleaner specifically for your stairs, then you could do a lot worse than this. 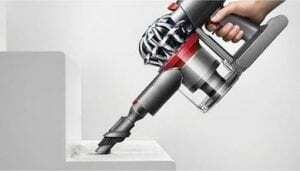 The Dyson V8 Animal is not as powerful as the newer V10 Cyclone and the battery doesn’t last as long, but it is significantly cheaper. I have included it in this list of the best stair vacuums as an option for those who want the raw power of a Dyson stick vacuum, and who have a smaller budget. Despite not having the suction power of the V10, the V8 Animal is still one of the most powerful cordless vacuums on the market. This is thanks to the Dyson digital motor V8, which has been engineered to give as much power as possible. This vacuum also features 2 Tier Radial cyclones, which create a huge amount of centrifugal force to drive dirt and microscopic particles into the dirt bin. The V8 also has two power modes which can be changed with the flick of a switch located at the top of the vacuum body. The standard ‘Powerful’ mode is more than enough to deal with most cleaning tasks in the house. If you have a really tricky cleaning situation, such as lots of embedded pet hair in the carpet, then you can switch to the ‘MAX’ power mode, which gives you even more powerful suction. Be aware, however, that the MAX mode only gives you 7 minutes of cleaning time. You really shouldn’t have to use this mode often, but it’s good to know that it’s there. Again, when comparing the V8 Animal to the newer V10 Absolute the 40-minute run time is 20 minutes shorter than the latest model. But a 40 minute run time in a cordless vacuum cleaner is actually very good. Most other cordless models at the moment have a battery life of 30 minutes or less. It’s only really the newer Dysons and Sharks that boast a longer run time. Even then, the first Shark vacuum that I looked at in this guide has a 60 minute run time, but that is two separate batteries with a 30 minute run time each. Taking all of this into account, a 40 minute run time in a cordless vacuum is still above standard and will ensure that you can clean your whole home on a single charge. One of the downsides to Dyson cordless vacuums is that the battery can’t be removed for charging. If you run out of charge mid-clean you have to wait for it to charge back up again, unlike the Sharks where you can just swap the battery out with a spare one that is fully charged. The 40 minute run time goes a long way to ensuring this never happens, and if you plan your cleaning and always keep it charged then this should never really be an issue. The V8 does come with a nifty charging dock that is also where you store the vacuum. 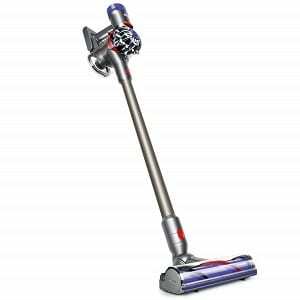 The Dyson V8 Animal is a worthwhile alternative to some of the more expensive vacuums that I have looked at. It is powerful, lightweight and has a longer run time than most other cordless models on the market. It is still classed as an expensive vacuum, but as it is a few years old it will no doubt keep falling in price. If you’ve read this far, hopefully, you will have a better idea of the type of vacuum that is ideal for cleaning stairs. It may be handy for you to know exactly what to look for in a stair vacuum, including different types, parts, and features. When it comes to cleaning stairs, one of the most important considerations is the size and type of vacuum you will be using. Large, bulky vacuums are generally no use for this type of cleaning as they can’t fit on the stairs. They also pose a health hazard as if you are trying to balance a large hoover on a step, there is more chance of it falling over and pulling you down with it. I mentioned above that upright vacuums are usually not the best type for stairs. The exception is if they contain a lift-away canister where the canister detaches from the vacuum body. This allows you to hold the canister in one hand while you clean with the other. The Shark NV801UKT is the best choice in this category. Handheld vacuums are the obvious choice to most people, but the truth is they rarely have the suction power required to clean carpets on stairs. They are generally more suited to quick cleanups and do not have the power or capacity to function as your main vacuum. For this reason, most people who buy a handheld vacuum buy it only for a specific purpose, which means they need another vacuum for their main cleaning. This increases costs and storage space, so an all-in-one vacuum is recommended. In my opinion, a cordless stick vacuum is an ideal choice for stair cleaning. They are lightweight, easy to manoeuvre and contain tools and accessories that aid in the cleaning of stairs. One of the many benefits of these types of vacuums is that they convert into a handheld, so they are an all-in-one solution that removes the need to buy several vacuums for different purposes. If you opt for a cordless vacuum, an important consideration is the battery run time. Generally speaking the more expensive the vacuum, the longer the run time will be. This fact is shown in the above reviews. The two most expensive cordless vacuums both have a run time of 60 minutes, while the cheapest model has a run time of only 15 minutes. The choice comes down to finding a balance between how much run time you want, and what your budget is. The last thing you want is to clean your stairs half way and then the battery runs out, meaning you have to wait hours for it to recharge. The models with removable batteries, such as the Shark IF260UKTH, help this problem by providing you with a spare battery that you can switch whenever you need. If you opt for a corded vacuum, then an important feature to think about is the reach of the vacuum. The reach is the total length of the power cord plus the length of the hose. When cleaning stairs, you want a vacuum that has a long hose so you can leave the vacuum at the bottom of the staircase and walk up the stairs with the hose. Any vacuum with a hose length shorter than the length of your stairs is going to cause frustration and a risk to your health. The price of a product is something that is important to most of us. Unless you are one of the lucky ones and money is no object to you, your budget will come into play. The best way to think about this is to first figure out how much you can afford to spend on a vacuum, and then look at the options in your price range. One thing to note is that the more expensive a vacuum is, the better it will be for cleaning stairs. This is because pricier options almost always have better suction, are easier to manoeuvre, and have all the tools and accessories required to clean stairs thoroughly. With most of the top vacuum brands offering 5-year warranties, a vacuum can be seen as an investment that will last you many years. In this guide, we have looked at the best vacuum cleaners for cleaning stairs. There are a few different types of vacuums to consider, such as cordless, upright, and handheld. Ultimately the decision rests with you, but I hope you have found my recommendations useful and now have all the knowledge you need to purchase a vacuum for your stairs. After doing a lot of research and reading countless customer reviews, I have come to the decision that the Shark IF260UKTH is the top vacuum when it comes to stair cleaning. A combination of the 60 minute run time, the DuoClean and Flexology technologies, and the Anti-Allergen sealed system makes this lightweight cordless vacuum an outstanding choice for cleaning your whole house, not just the stairs. At the other end of the scale, the Black & Decker PD1820L is a solid option if you are on a budget. It may not be the best choice if you are looking for a main vacuum, but for quick jobs like cleaning stairs, it has enough to get the job done, at a fraction of the price. If an upright vacuum is your preference, then the Shark NV801UKT will be right up your street. It is powerful, versatile and cheaper than the cordless models. The added bonus of a lift-away canister means it is perfect for tackling hard to reach areas such as a staircase.